There’s no better way to explore one of the many art towns scattered around Tuscany than spending an afternoon to walk around and checking out its hidden views and corners, history and beauty. 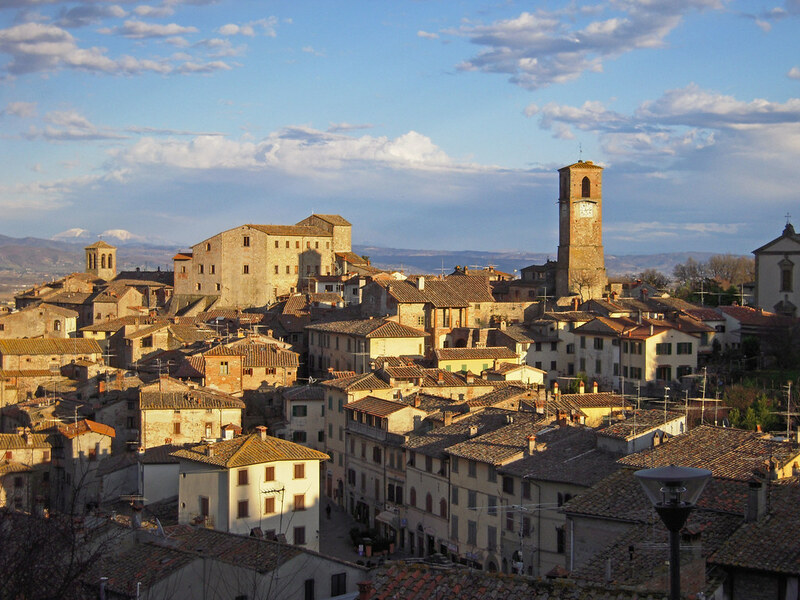 This holds true for Anghiari, a beautiful town for which we offer this comprehensive walking town. Starting from Campo alla Fiera, an area once used for the cattle market and where you can enjoy a wonderful panorama of the entire Tiber Valley, the itinerary begins with a visit to the Propositura di S. Maria delle Grazie, also known as the Chiesa del Fosso (Church of the Ditch) because of its position in the ancient ditch which ran along the outside of the town walls. Built in the 18th century, it is the newest church in the old town. Inside there are a number of sixteenth-century paintings including an Ultima Cena (Last Supper) and La Lavanda dei Piedi (The Washing of the Feet) by the Florentine painter Giovanni Antonio Sogliani and a Deposizione dalla Croce by Domenico di Bartolomeo Ubaldini known as "Il Puligo". Behind the main altar there is also a glazed, 16th-century terracotta plaque, depicting La Madonna della Misericordia from the workshop of Andrea della Robbia. When you come out of the church of the Propositura you find yourself opposite il Campano (The Bell Tower), or the town's tower where the clock is hung. It was built at the end of the 16th century on the remains of a more ancient tower. Continuing on we can admire the walls that surround the town, uniform and almost unaltered from their thirteenth century line with the exception of the Southern Bastion called “del Vicario”, which was designed in 1553 by Girolamo Magi under the orders of Cosimo de' Medici the First. This is where you’ll also find Il Conventone, the stronghold or bridge house that transpired out of the conversion of the ancient Camaldolese monastery of S. Bartolomeo, which was part of the elements that once formed the 'castellum', around which the first settlement of Anghiari took shape. Next to Il Conventone you come to Palazzo Pretorio, nowadays the Town Hall, with its facade decorated with the coats of arms of the various ‘vicari’ and ‘podestà’ (administrators and judges) that carried out the administration of justice on behalf of the Florentine government. At one time it was the home of the old Tribunal and the ground floor holds a number of dungeons, a chapel and a fresco of La Giustizia (Justice), a work from the 15th century probably attributable to Antonio di Anghiari, the first local teacher of the great Piero della Francesca. Going down from Piazza del Popolo along one of the charming medieval lanes, you come to the Chiesa della Badia, dedicated to St. Bartholomew. Ancient in origin, possibly starting out as an informal gathering place for prayer, the church was the first religious building in Anghiari. Rebuilt by Tarlati in the 14th century, it was then enlarged in 1447. Its interior is distinctive for its asymmetrical floor plan. The central part of the beautiful altar on the left hand side was made, according to Vasari, from a design by Guillaume de Marcillat, and contains a wooden sculpture of the Madonna con Bambino (Madonna and Child) attributed to Tino di Camaino. On the 18th-century main altar there is a wooden cross (late 13th - early 14th century) made in Tuscany but of a style linked to northern art, which has always been an object of special popular devotion. Right in front of the Church of the Badia is the deconsecrated church of Corpus Domini, a building which dates back to the first half of the 16th century and nowadays is home to the Museo della Misericordia. The museum has a collection of objects and documents relating to the local history and activities of the Confraternita (Brotherhood) which was founded in 1564 to help the poor and the sick and to bury the dead. Proceeding along the narrow alleys of the town you reach the quarter of Borghetto (“little town”), built in the 1400s, where you find Palazzo Taglieschi, home of the Museo Statale which holds works of art originating from the churches and historic buildings of the High Tiber Valley and tools which represent the traditional culture and economy of the area. The building, which belonged to the Anghiarese Taglieschi family, was built by the military captain Matteo Cane (Matthew the Dog) and is a good example of fifteenth century private architecture for residential use but also has, however, traces of medieval characteristics. Inside the museum the collection ranges from stone pieces to detached frescoes, sculptures, paintings, keys and utensils right up to the splendid wooden painted sculptures by Jacopo della Quercia. Other important pieces are a glazed terracotta plaque of the Nativity by Andrea della Robbia, a positive table organ dating to the early 16th century and some Florentine style paintings by Matteo Rosselli and Jacopo Vignali. Opposite Palazzo Taglieschi you can admire Palazzo del Marzocco, home of the Museo della Battaglia e di Anghiari. The building gets its name from the statue which sits high up on its corner and is the Marzocco (or lion) of Florence, the symbol of the sovereignty of the people. The Renaissance building was constructed for the noble Angelieri family. On the first floor there is an interesting model re-enacting the final phase of the famous Battle of Anghiari, fought on the 29th June 1440 between the Florentine troops allied with the Pope against the Milanese Visconti militias. The reputation of this battle is closely linked with Leonardo da Vinci, who was commissioned to depict the event in Florence’s Palazzo Vecchio to celebrate the Florentine victory. Sadly, no sign remains of the work by the great artist, other than copies made by later artists, including a 17th-century copper engraving by Gérard in the British Museum in London. In the Palazzo del Marzocco there are reproductions of three other depictions of the Battle of Anghiari which had been painted on wedding chests, amongst them is the one held in the National Gallery of Ireland in Dublin. There is also a large canvas by the Bolognese artist Vittoria Chierici which gives a very personal interpretation of the battle. From Piazza Mameli, going down through a tunnelled alleyway, you come to Via di Ronda, a charming route which was the part of the road situated on the northern side of the town walls, upon which, in the middle of the 15th century a semicircular tower was built to form the apse of St. Augustine Church, an unusual solution derived from military architecture adopted by Francesco di Giorgio Martini for the apse of Urbino Cathedral. From here you can enjoy a splendid view across the Plain of Anghiari, the plain which was the theatre where the famous battle was fought. Coming out of the Via di Ronda and going through the Porta Nuova or Fiorentina (New or Florentine Gate) you come into the main square of the town: Piazza Baldaccio Bruni, once known as Mercatale from where you can admire the fourteenth-century, straight road which, in just 6 km, joins Anghiari to nearby Sansepolcro. The tour then continues through Galleria Girolamo Magi, known as Le Logge, inaugurated in 1889 and for many years the home of the covered seed and grain market. This leads us into Piazza IV Novembre with the Teatro dei Ricomposti, which was part of an eighteenth century complex built for Benedetto Corsi also including a chapel, which has now become the Tempio Votivo ai caduti (War Memorial), and the adjacent family house, now used for Council Offices and the Public Library. Turning back through Le Logge you can finally go up the hill to the Chiesa e Convento della Croce which makes an ideal architectural backdrop to the long fourteenth-century road commissioned by the Aretino Bishop Guido Tarlati to join Anghiari and Sansepolcro. The origins of this church are linked to St. Francis of Assisi who passed through Anghiari in 1224 on his return from the sacred mountain of La Verna where he had received the stigmata. He planted a cross at the junction of three roads, in the place where this sixteenth century church dedicated to the cross now stands. Inside the church there are works by Domenico Passignano, Giovan Battista Susini and a seventeenth-century work of Ritrovamento della Croce (Finding the True Cross). 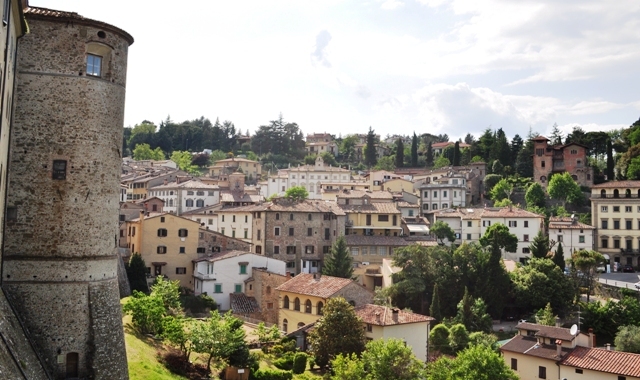 Anghiari is considered one of the "most beautiful villages in Italy" and received the Orange Flag by the Italian Touring , the quality label given by the Italian Touring Club for quality eco-tourism. It’s not difficult to understand way: its windy streets and stone houses decorated with flowers seem to get out of the Middle Ages. 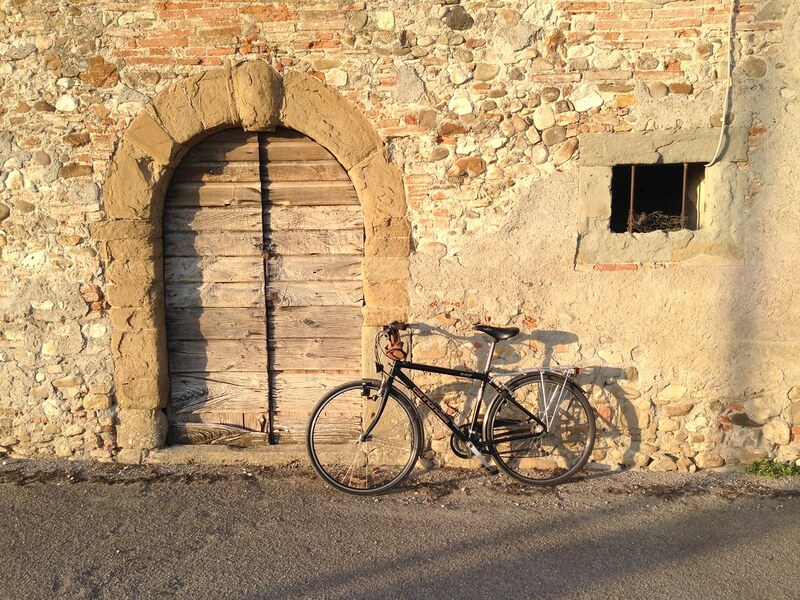 Anghiari is a small village enclosed in a massive 13th century walls with perfectly conserved and picturesque corners. Just walk into the charming city centre and breath the atmospheres of the past eras. The historic Battle of Anghiari, which took place here on June 29, 1440 and marked the victory of the Florentine troops, allied with the Pope, over the army from Milan, is pictured in a legendary fresco by Leonardo da Vinci in the Salone dei Cinquecento in the Palazzo Vecchio, Florence. Commissioned to celebrate this victory, the fresco is today lost, but some people believe it to be hidden beneath one of the later frescoes, the Vasari’s one. Anghiari has something in common with San Francisco in the USA, and it is the road leading to the village: straight and with a steep gradient! The Mostra-Mercato dell’Artigianato della Valtiberina (the Handicraft Market of the Tiber Valley) is held in Anghiari in late April and early May. The event aims mainly to enhance the work of craftsmen, from antiques to the manufacture of iron and pottery, from carved stone to precious metals, from fabrics to leather. This could be a good occasion to visit the village!